The ultra-small 3-eye Bi-Beam LED headlamps combine advanced design with excellent light distribution. 16 LEDs in the sequential turn signal lamps illuminate sequentially in a flow from the inner side to the outside of the vehicle. 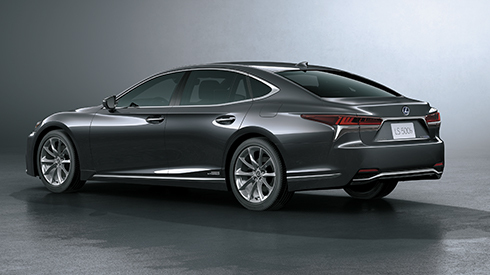 All the rear combination lamps are LEDs, including the lamps on the trunk lid. The sequential turn signal lamps illuminate in a sharp, well-defined flow. 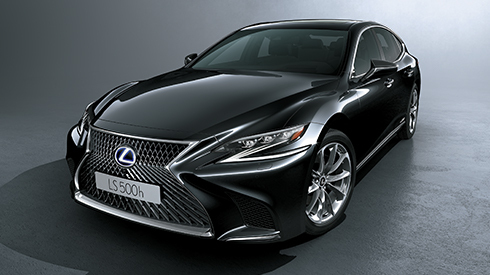 Door mirrors Sculpting the inside of the mirror visor gives it a sharp shape, and creates more space between the mirror and front pillar, enhancing aerodynamic performance and reducing wind noise. 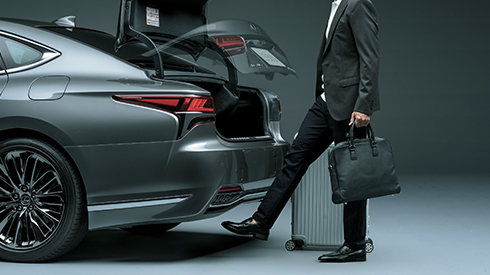 Even if both hands are full, when carrying the Electronic Key you can open and close the trunk lid automatically by moving your foot under the rear bumper. 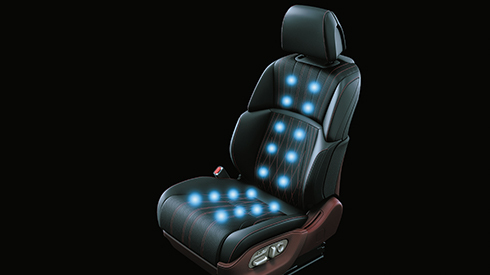 The power rear seats use motors and a newly-developed pneumatic system that inflates and deflates air bladders to make fine-grained adjustments to every aspect of the seats. 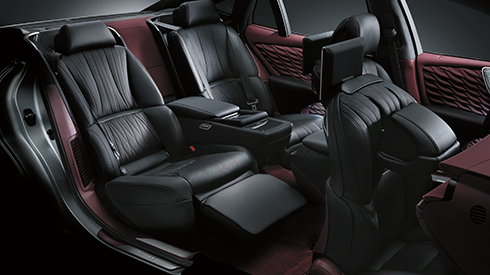 The rear seat behind the front passenger’s seat has a maximum 1020mm of foot room and a power ottoman that provides generous support to the lower legs so the occupant can relax in refined comfort. In addition, three position presets allow the occupant to choose their preferred posture. “Business” is the normal position. 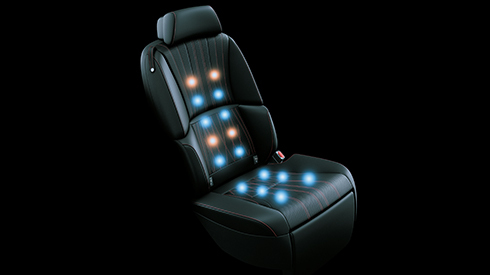 “Entertain” reclines the seatback to a relaxing angle and positions the front passenger’s seat for optimal viewing of the rear seat display. 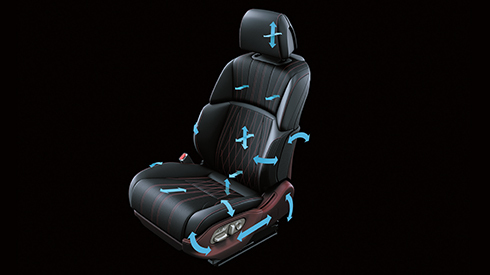 “Relax” moves the front passenger’s seat to the forward-most position and deeply reclines the rear seatback to optimize the rear seat space. The newly-developed ` system provides fine-grained support for every part of the body. Shoulder supports for the shoulder blades help steering operation. The upper body is also supported during cornering, enhancing the feeling of unity with the car. Hip support provides special support for the back of the hips, to help maintain posture during braking and cornering. Cushion side supports provide a high degree of grip, contributing to stable body hold during cornering. 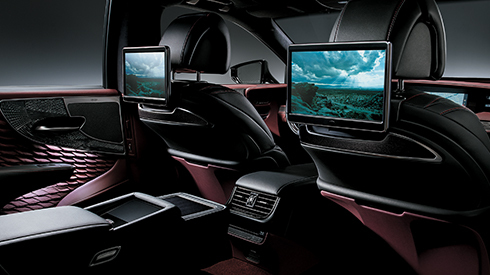 The rear seat entertainment system includes 11.6-inch displays that automatically adjust with the seat position to maintain an excellent angle for easy viewing, a Blu-ray Disc player, SD card slot, and a HDMI jack that enables the connection of a computer or other devices. Rear seat passengers can also enjoy videos, music and other media stored on mobile devices using Miracast or DLNA (Digital Living Network Alliance). Air bladders integrated into the seat cushion and seatback are inflated to apply pressure to the occupant’s back and thighs. The system also utilizes dedicated heaters to promote relaxation through repeated warming and cooling. A total of seven programs for both the entire body (Full Body Refresh, Full Body Stretch and Full Body Simple) and specific parts of the body (Upper Body, Lower Body, Shoulder and Lumbar) can be selected. 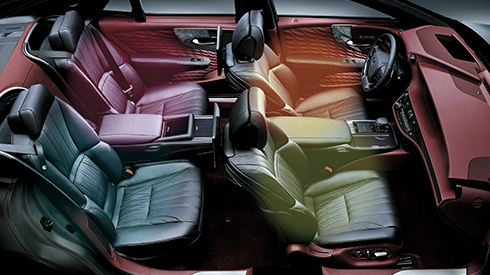 The multi-operation panel in the rear center armrest puts intuitive control of the audio, air-conditioning, seat and relaxation functions, sunshades and lighting at your fingertips. This newly-developed 16-channel 3D surround sound system drives 23 speakers. The 7 Unity speakers, ceiling speakers and QLI (Quantum Logic Immersion) surround technology fill the cabin with uniform sound quality, enveloping the listener in natural realistic sound with the precise positioning of a live sound stage, excellent separation and dynamic reproduction of sound sources. 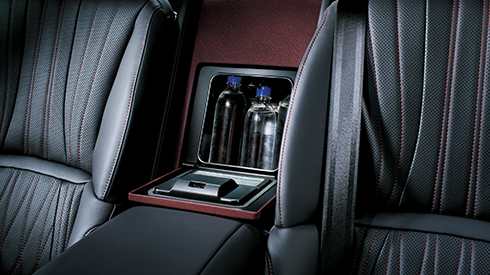 Air chilled by the rear cooler in the trunk space circulates through the cool box to keep items cool. 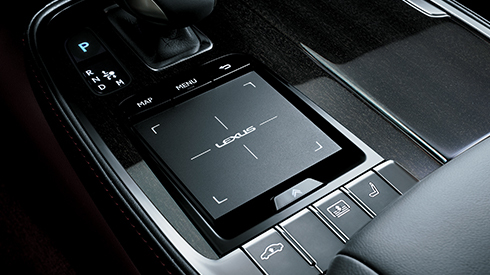 Cool air vents allow the airflow to be switched on and off as required. The rear window sunshade covers the entire window on both sides with no gaps. 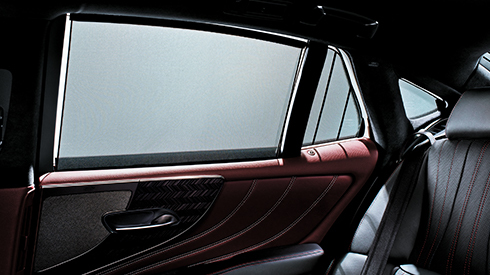 Operation of the rear quarter window sunshades is linked with the rear door window sunshades to provide comfort and privacy in the rear seats. Air bladders integrated into the seatback and seat cushion are inflated to apply pressure from the occupant’s back to the thighs, contributing to a feeling of relaxation. Programs can be selected for the entire body as well as particular areas (Upper Body, Lower Body and Lumbar). 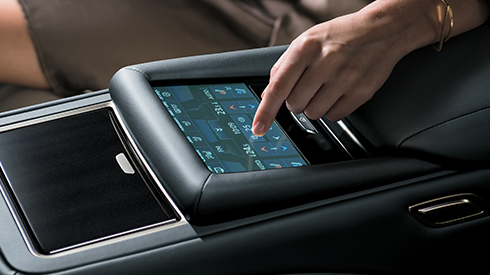 The Remote Touch Interface is designed for smartphone style operation. The cursor can be adjusted to stop following flick operation to suit the user’s preferences. Pinch-in and pinch-out operation enables continuous in and out zooming. 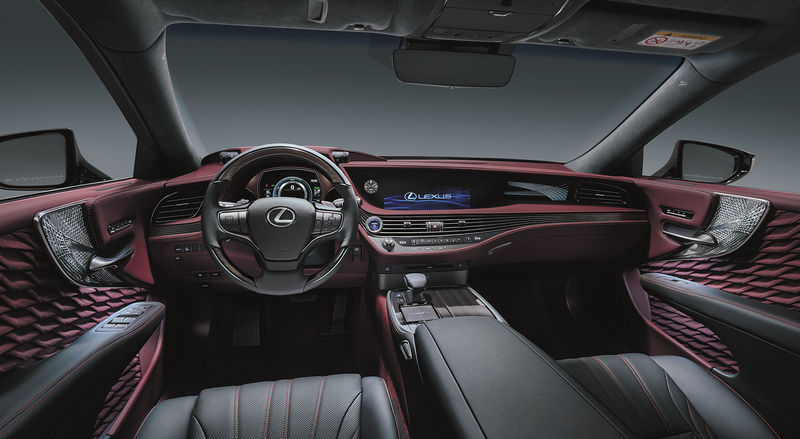 Lexus Climate Concierge coordinates with the 4-zone independent temperature control to automatically control the auto air conditioner with the seat heaters, seat ventilation and steering wheel heater to provide optimal comfort for each occupant. 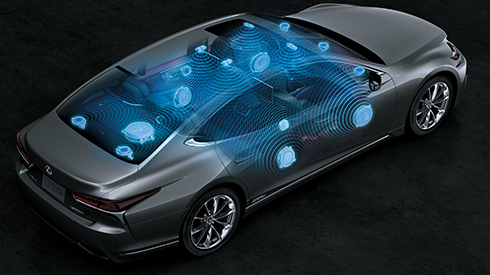 The body surface temperature of occupants is detected by IR (Infra-red Rays) matrix sensors to quickly provide the optimal level of comfort for all occupants. It also detects sunlight in the early morning and at sunset and controls the vehicle’s climate control system to maintain comfort. In addition to the vehicle height adjustment function which can be switched between Normal and High settings, access mode automatically raises the vehicle to make ingress and egress easy. To make the front seatbelts easy to use, the seatbelt buckle lifts up when the door is opened and then moves back down once the seatbelt is fastened. 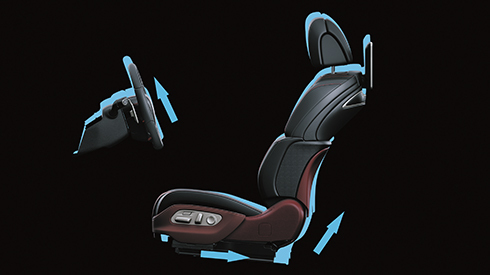 In addition to auto slide-away and return functions, the front seats feature auto lift-up function (Driver’s seat only) and cushion side-away functions. 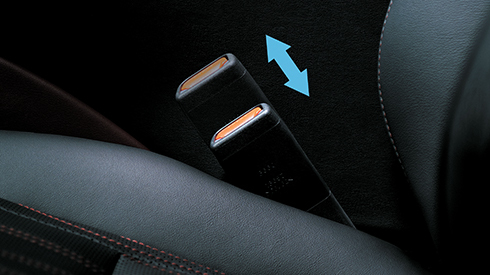 For easy access, auto lift-up raises the seat lifter when the driver gets out and then returns it to the original seat position when the driver gets in. Cushion side-away opens the outboard side cushion supports to reduce the pressure on the thighs while getting in and out.